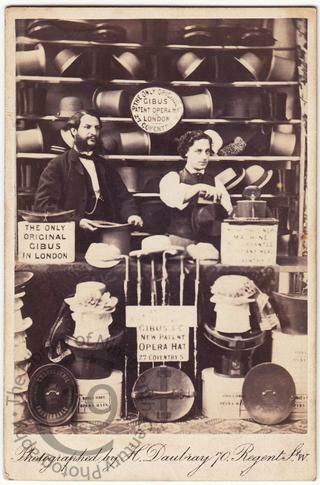 A carte-de-visite portrait of two London hatters with an array of their stock. The reverse of the mount carries an advertisement for their business at 27 Coventry Street. The other man, the ‘Gibus’ of the partnership, also appears on the 1861 census, a lodger at 77 York Road in Lambeth. A 40-year-old hatter at the time of the 1861 census, he was born in Paris. Although he gave his name as ‘Meriade Gibus’, his real name was in fact Meriade Anquez. The Gibus brothers Antoine and Gabriel were famous Parisian hatters who had invented the collapsible opera hat – known as the Gibus or ‘chapeau claque’ in French to this day - and patented many variations of their original design between 1834 and 1870. Although both brothers had sons that followed them into the family business, the man in this portrait appears to have had no legitimate connection to the family and was presumably trading under their famous name without their consent. On 3 July 1853 he married Sarah Annie Smith, daughter of a builder, at St John the Evangelist in Waterloo. According to their marriage certificate, Anquez was a hatter living in Waterloo Road; his father, Martial Anquez, was a hairdresser. The couple separated in 1858 and in 1866 Mrs Anquez petitioned for divorced citing her husband’s cruelty and adultery [though given the limited grounds on which divorce could then be granted, this may have been merely a formality to comply with the terms of the law]. Meriade Anquez died on 10 May 1893 at 19 Mornington Crescent, Camden. At the time of his death, he was still trading as a hatter under the name of Gibus with a shop at 10 Chandos Street, on the corner of St Martin’s Lane. His effects were valued at £260. An advertisement was placed in the French press [Le Temps, 14 November 1893] but no heirs coming forward his estate passed to one John Macqueen, a hat manufacturer to whom Anquez owed money at the time of his death. Photographed by Henry [Henri] Daubray of 70 Regent Street, London. Born in Paris in 1817, Daubray had formerly operated from a studio at 27 Coventry Street, so must have been personally acquainted with the two hatters.